Conventional radiotherapy can control spinal oligometastases. When lesions to the spine occur in diffuse pattern, conventional radiation is effective and it is a cost-efficient procedure. 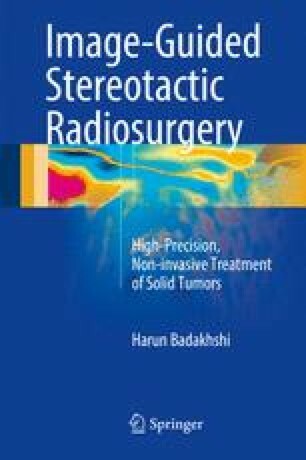 When spine metastases are limited by volume, number, and occurrence site, image-guided stereotactic radiosurgery might be a good alternative. It spares healthy tissue, especially the spinal cord. Many patients (f/m) with metastasizing cancers like breast and lung cancer or prostate cancer could be controlled very well in long term. Invasive surgical procedures indeed even when performed in a minimally invasive mode do not seem to be a good option. Any “standard” has to prove its superiority in terms of safety and effectiveness for patients (f/m), and it is true in the frame of cost efficiency too. Image-guided stereotactic radiosurgery could affect spinal lesions by deactivating tumor cells because they are responsive to high-dose radiotherapy. The aim would be to prolong the time free of symptoms and, therefore, of a better quality of life. Consecutively, it demonstrates a noninvasive high-precision and safe technique in treating patients (f/m). Kitagawa R, Murakami H, Kato S, Nakada M, Demura S, Tsuchiya H. En bloc resection and reconstruction using a frozen tumor-bearing bone for metastases of the spine and cranium from retroperitoneal paraganglioma. World Neurosurg. 2015. pii: S1878-8750(15)01303-0. doi: 10.1016/j.wneu.2015.09.102.